Within the Hugh M. Cunningham Companies’ headquarters lies Hugh U Lecture Hall. This area is used for internal, distributor and contractor trainings. HMC also provides use of the facility, free of charge, to our business partners, trade groups, and other associated parties. With 1,000 feet of square space, Hugh U Lecture Hall is the perfect place to hold meetings and trainings. The space can seat up to 50 people. Direct access to the training facility through a separate door from the outside, allows the facility to be utilized without disrupting day-to-day business activities. The training room is conveniently located next to the break room and restrooms for the comfort of the meeting participants and ease in serving food and beverages during meetings. 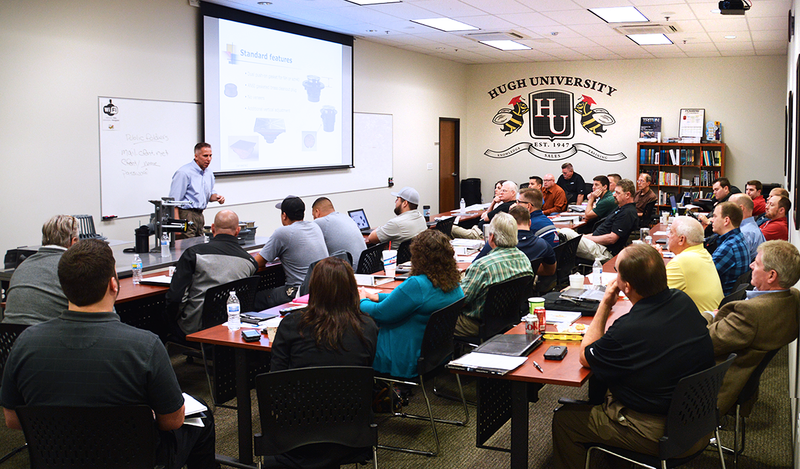 Please contact your HMC sales associate if you would like to schedule your next meeting in the Hugh U Lecture Hall.